Click the following link to be directed to the Chemistry Department Directory for full profiles of all Chemistry faculty and professional staff or scroll this page to view a snapshot of each Chemistry Professor and their research interests. The Leber Research Group has been studying the vinylcyclobutane-to-cyclohexene rearrangement of bicyclo[3.2.0]hept-2-enes and bicyclo[4.2.0]oct-2-enes. Based on our experimental work as well as that of others coupled with dynamic modeling studies, current thinking is that the rearrangement occurs via a short-lived diradical intermediate. We are currently attempting to utilize the cyclopropylcarbinyl (CPC)-homoallylic radical rearrangement as an indirect probe of the purported diradical intermediate. 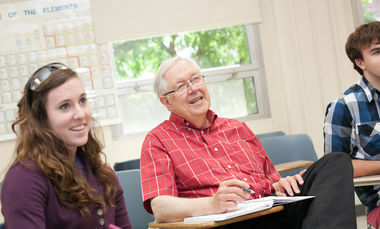 Professor Thomsen is currently serving as an Associate Dean of the Faculty in the Office of the Provost of the College. Nucleophilic and electrophilic substitution reactions in ionic liquids. Photo-acid catalyzed organic reactions. Solvent effects on solution photophysics. Elucidating the fundamental processes of glow discharge plasmas that lead to their analytical utility and expanding their applications in trace element analysis in diverse fields ranging from environmental monitoring to materials science. We are interested in the design, synthesis, and study of molecular devices that incorporate the elements of molecular recognition and host/guest chemistry. One category of such devices that we have focused on for the past few years is conformationally flexible host molecules that can be organized by an analyte to subsequently bind solvatochromic fluorescent indicators. This cooperative association can be used to signal the analyte binding event. Our novel design for fluorescent chemosensing may be applicable to the detection of low concentrations of so-called quenching heavy metal or transition metal ions in aqueous solution. My research focuses on better understanding trace metal cycling in the marine environment. Since metals do not degrade, metal accumulation can be used to understand changes in the amount of metals being added to the marine environment and/or changes in conditions that affect metal accumulation over time. To improve our understanding of metal cycling, we study sediments obtained from marine waters. Because of the complexity of environmental samples, my research group also studies single mineral phases in conjunction with simple organic molecules in the laboratory to discern individual controls on metal adsorption that might be occurring in the environment. Both approaches provide us with information regarding metal sequestration in sediments under various conditions. 1. The synthesis of nucleotides and proteins with an azide (R-N3) probe to monitor electrostatic environments and solvent dynamics by vibrational (IR) spectroscopy. 2. The design and synthesis of air-stable, water-soluble organic radicals such as sulfonated BDTPP for dynamic nuclear polarization imaging. 4. The design and synthesis of musks as perfumes. 5. Collaborative work to synthesize ganglioside GM3 to help Amish children. 6. The history of organic chemistry. My research focuses on the study of protein and nucleic acid structure with site-specificity utilizing a variety of spectroscopic methods including NMR and FTIR spectroscopy coupled with isotopic and/or chemical labels. I am interested in the relationships between surface and solid-state properties of materials and their technologically important behavior. The size and composition of semiconductor particles affects how they absorb light and conduct electrical charge, and we use this to design particles effective in solar energy conversion devices. We also explore how the self-assembly of organic molecules into ordered monolayers at the liquid/solid interface influences solution and surface phenomena. 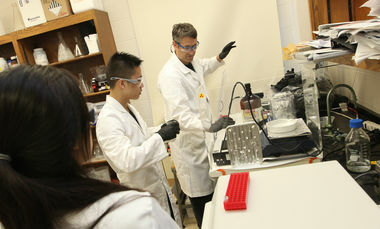 Work in my lab will utilize a variety of biochemical techniques and will focus on understanding protein function through structure using X-ray crystallography. An overarching theme of the projects I am interested in is how cells sense and respond to their environment. One project uses in vitro techniques to study how the pathogenic bacteria Vibrio cholerae utilizes exogenous heme as an iron source for the cell while preventing the toxic side effects that heme could cause. Another project begins to investigate the protein interactions involved in a new nitric oxide (NO) signaling pathway in eukaryotes involving S-nitrosothiols. The third project aims to study the mechanism by which a bacterium involved in bioremediation of the environment, Dehalococcoides ethenogenes, senses and degrades the pollutant tetrachloroethene which is produced by dry cleaners and chemical industries. Professor Brandt is a chemist who rejoices particularly in the splendor of biological molecules. His graduate work involved incorporating unnatural amino acids into human ion channels expressed in the eggs of carnivorous frogs. After post-doctoral research on the X-ray crystallography of various proteins, he currently has a two-fold focus. One project in his lab addresses the biochemistry of proteins involved in the virulence mechanism of the malaria parasite Plasmodium falciparum. The other seeks to synthesize photosensitive molecules with the goal of controlling, via a pulse of light, specific biochemical pathways inside living cells. Work in my lab will involve the interface of synthetic organic chemistry and medicinal chemistry. I am driven to discover and develop new reactions that will not only enable or shorten synthesis of small heterocyclic compounds, but also have a broader impact on the study of biological systems and in drug discovery. The seemingly simple inorganic component of bone and teeth--hydroxylapatite, Ca5(PO4)3OH--has occupied our attention for the last decade. We are intrigued by the fact that a great variety of ions can replace, in part, those of apatite, which leads to applications such as remediation of heavy metals, ion-exchange, nuclear waste encapsulation, phosphors, and so on. We have prepared apatites containing different divalent cations of elements such as Sr, Ba, Pb, and Cd and have explored the structure of these using solid state NMR and infrared spectroscopy, as well as X-ray diffraction. Our most recent focus has been on the substitution of the carbonate ion for phosphate or hydroxide and the presence of water in the structural channels that are important to the flexibility of the these compounds. Currently we are attempting to identify the location of the carbonate ion in the structure of various apatite types, with the hope of understanding how composition and structure may affect its location. 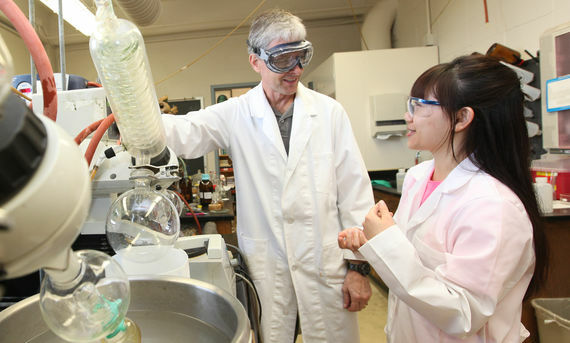 Collaborative research has a long history in F&M's Chemistry Department beginning with Claude Yoder whose collaboration with Charles Schaeffer, Jr. at Elizabethtown College spans 40+ years. 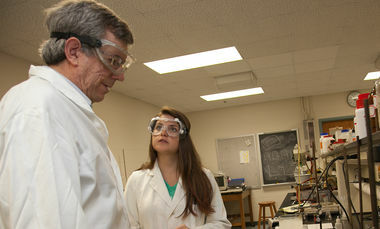 Dr. Phyllis Leber and Dr. John Baldwin, Distinguished Professor of Chemistry and William Rand Kenan, Jr. 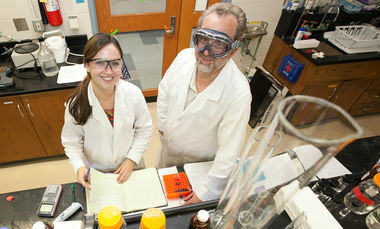 Professor of Science at Syracuse University, have been collaborating since the summer of 2000. Although the focus of their research has been the elucidation of the mechanism of the [1,3] sigmatropic rearrangement of vinylcyclobutanes, they have also conducted mechanistic studies involving [1,5] hydrogen shifts and cyclobutene electrocyclic ring openings. In all of these cases the aim of collaboration is to understand the extent and limits of application of the Woodward-Hoffman theory of conservation of orbital symmetry. Our collaborative efforts suggest that the vinylcyclobutane rearrangement traverses a shallow potential energy surface that yields a short-lived diradical intermediate. To date, the collaboration has yielded a total of 14 publications including two review articles. A total of 15 students have appeared as coauthors on 10 of these publications. J. E. “Thermal Isomerizations of cis,anti,cis-Tricyclo[7.4.0.02,8]tridec-10-ene,” J. Org. Chem. 2012, 77, 3468-3474. Baldwin, J.E. ; Leber, P.A. "Molecular Rearrangements through Thermal [1,3] Carbon Shifts." Org. Biomol. Chem. 2008, 6, 36-47. Leber, P. A.; Bogdan, A. R.; Powers, D. C.; Baldwin, J. E. "Thermal Isomerizations of cis,anti,cis-Tricyclo[6.4.0.02,7]dodec-3-ene to trans- and cis,endo-Tricyclo[6.2.2.02,7]dodec-9-ene: Diradical Conformations and Stereochemical Outcomes in [1,3] Carbon Shifts," Tetrahedron 2007, 63, 6331-6338 (50th Anniversary Special Issue). Powers, D. C.; Leber, P. A.; Gallagher, S. S.; Higgs, A. T.; McCullough, L. A.; Baldwin, J. E. "Thermal Chemistry of Bicyclo[4.2.0]oct-2-enes," J. Org. Chem. 2007, 72, 187-194. Baldwin, J. E.; Leber, P. A.; Powers, D. C. "Thermal Reactions of 7-d- and 8-d-Bicyclo[4.2.0]oct-2-enes," J. Am. Chem. Soc. 2006, 128, 10020-10021. Baldwin, J. E.; Bogdan, A. R.; Powers, D. C.; Leber, P. A. "cis,anti,cis-Tricyclo-[6.3.0.02,7]undec-3-ene: A Template for [1,3] Migration via an Exclusive Symmetry-forbidden Suprafacial Retention Pathway," Org. Lett. 2005, 7, 5195-5197. Baldwin, J. E.; Gallagher, S, S.; Leber, P. A.; Raghavan, A. “The Thermal Disrotatory Electrocyclic Isomerization of cis-Bicyclo[4.2.0]oct-7-ene to cis,cis-1,3-Cyclooctadiene,” Org. Lett. 2004, 6, 1457-1460. Baldwin, J. E.; Gallagher, S. S. ; Leber, P. A.; Raghavan, A. ; Shukla, R. “Deuterium Kinetic Isotope Effects and Mechanism of the Thermal Isomerization of Bicyclo[4.2.0]oct-7-ene to 1,3-Cyclooctadiene,” J. Org. Chem. 2004, 69, 7212-7219. Leber, P. A.; Baldwin, J. E. “Thermal [1,3] Carbon Sigmatropic Rearrangements of Vinylcyclobutanes,” Acc. Chem. Res. 2002, 35, 279-287. Baldwin, J. E.; Leber, P. A. ; Lee, T. W. “Kinetic Derivations for Thermal Isomerizations of Monodeuterio Cyclic 1,3-Dienes Through 1,5-Hydrogen Shifts,” J. Chem. Educ. 2001, 78, 1394-1399. Baldwin, J. E., Leber, P. A. ; Lee, T. W. “Kinetics and Activation Parameters for the Thermal 1,5-Hydrogen Shifts Interconverting the Four Monodeuterio-cis,cis-1,3-cyclooctadienes,” J. Org. Chem. 2001, 66, 5269-5271. Baldwin, J. E.; Leber, P. A. “New Thermal Reactions of Deuterium-labeled Bicyclo[3.2.0]hept-2-enes: Bicyclic Skeletal Inversion and Epimerization at C7,” J. Am Chem. Soc. 2001, 123, 8396-8397. Baldwin, J. E.; Leber, P. A. "Thermal Reactions of endo- and exo-6-methylbicyclo[3.2.0]hept-2-enes: An Experimental Test for a Potential Ring Inversion," Tetrahedron Lett. 2001, 42, 195-197. My collaboration with Dr. Morten Andersen from ETH Zurich grew from his interest in using isotope geochemistry to better understand Earth system processes at the Earth's surface. His particular interest involves global U cycling and the unique 238U/235U ratio that develops as a response to changes in the amount of ocean oxygenation. I have a long-standing interest in U geochemistry and was able to share with him a selection of marine sediment samples for analysis. I have enjoyed the opportunity to work with Dr. Andersen on the interpretation of his results. Andersen, M. B.; Vance, D.; Morford, J. L.; Bura-Nakic, E.; Breitenbach, S.F.M. ; Och, L. Closing in on the marine 238U/235U budget. Chemical Geology 2016, 420, 11–22. Dr. David Hastings and I belonged to the same graduate group at the University of Washington, where we both focused on redox sensitive trace metals. I was very interested in the recent research he was doing at Eckerd College in Florida in response to the Deep Water Horizon oil spill in the Gulf of Mexico. I have enjoyed the opportunity to work with Dr. Hastings on the interpretation of changes in trace metal concentrations in sediment cores from the Gulf of Mexico. Hastings, D.W.; Schwing, P.T. ; Brooks, G.R. ; Larson, R.A.; Morford, J.L. ; Roeder, T.; Quinn, K.A. ; Bartlett, T.; Romero, I.C. ; Hollander, D.J. Changes in sediment redox conditions following the BP DWH blowout event. Deep Sea Research Part II Topical Studies in Oceanography 2014, DOI:10.1016/j.dsr2.2014.12.009. My collaboration with Dr. Bill Martin began when I was a post doctoral scholar at the Woods Hole Oceanographic Institution (November 2000 – October 2002). I worked extensively with Bill to study the controls on trace metal mobility in the environment, particularly in coastal areas off Massachusetts. Fieldwork is incredibly labor intensive and continues from the time the samples arrive (often in the early afternoon for coastal work) until the sampling is completed (often in the early hours of the next morning). Because we do not want conditions in the sediment cores to change prior to sampling, we endeavor to keep the samples under conditions similar to their in situ conditions, which means sampling in a cold room at 4°C and working with samples in large nitrogen-filled glove bags. Analyses, which are time sensitive, must then be completed the following day. I have been fortunate to have several F&M undergraduates (Melissa Reinard '03, Sarah Gallagher '04, Gloria Yen '06 and Elizabeth Herrle '06) accompany me to Woods Hole and assist in supply preparation, sampling and analysis. Gloria also returned to WHOI with me to use the ICP-MS facility for sample analyses. Morford, J.L. ; Martin, W.R.; Carney, C.M. Rhenium Geochemical Cycling: Insights from Continental Margins. Chemical Geology 2012, 324-325, 73-86. Morford, J.L., Martin, W.R., François, R.; Carney, C.M. A Model for Uranium, Rhenium and Molybdenum Diagenesis in Marine Sediments Based on Results from Coastal Locations. Geochimica et Cosmochimica Acta 2009, 73, 2938-2960. Morford, J.L. ; Martin, W.R.; Carney, C.M. Uranium Diagenesis in Sediments Underlying Bottom Waters with High Oxygen Content. Geochimica et Cosmochimica Acta 2009, 73, 2920-2937. Morford, J.; Martin, W.; Kalnejais, L.; Francois, R.; Bothner, M.; Karle, I.-M. Insights on Geochemical Cycling and Diagenesis of U, Re and Mo from Pore Water Profiles and Benthic Chambers from Seasonal Sampling in Hingham Bay, Massachusetts, U.S.A. Geochimica et Cosmochimica Acta 2007, 71(4), 895-917. Morford, J.; Kalnejais, L.; Martin, W.; Francois, F.; Karle, I.-M. Sampling Marine Pore Waters for Mn, Fe, U, Re, and Mo: Modifications on DET (Diffusional Equilibration Thin Film) Gel Probes. Journal of Experimental Marine Biology and Ecology 2003, 285-286, 85-103. My collaboration with Dr. Yoder grew from a shared interest in metal-organic interactions. 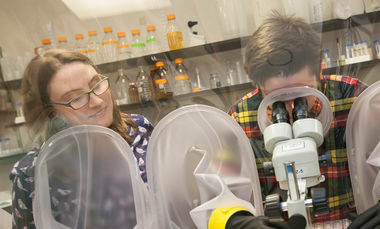 Dr. Yoder had previously provided assistance to one of my earlier research students (Kelly Murphy, class of 2009) who was working on molybdenum complexation with small organic molecules. However, Kelly encountered difficulties in using 95Mo NMR to understand the structural details of the complexes that were forming. 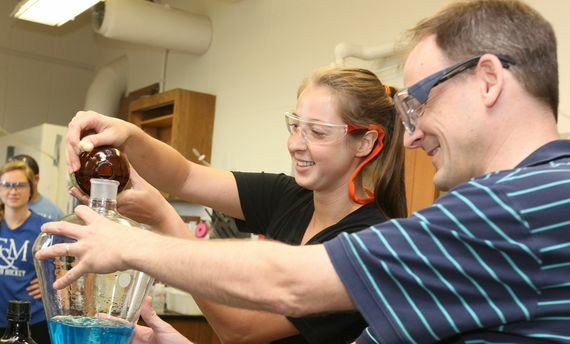 My initial collaboration with Emily Christie (class of 2015) during Summer 2012 on a different project transitioned into co-mentoring with Dr. Yoder during Summer 2013. 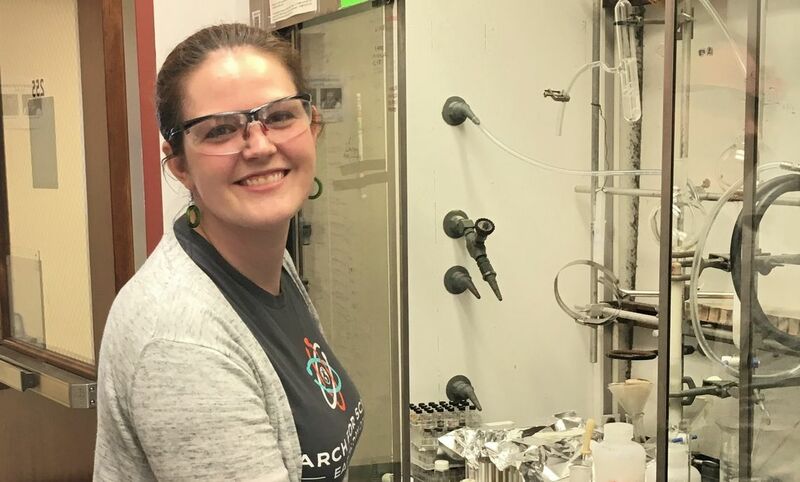 During that summer and the following academic year, Emily was able to complete the detailed work that was required to understand how 95Mo NMR might help in understanding the intricacies of Mo-organic complexes. Yoder, C. H.; Christie, E. L.; Morford, J. L. 95Mo NMR study of the effect of structure on complexation of molybdate with alpha and beta hydroxyl carboxylic acid ligands. Polyhedron 2015, DOI: 10.1016/j.poly.2015.09.009. 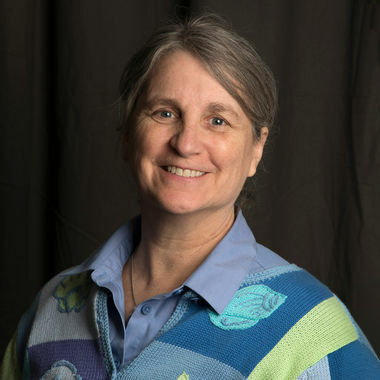 Professor Yoder collaborates with Dr. Jill D. Pasteris in the Department of Earth and Planetary Sciences at Washington University, St. Louis, MO . 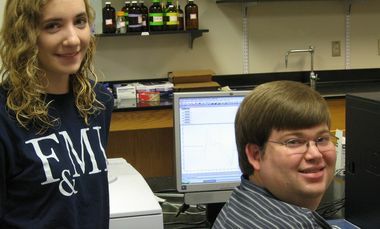 Their research involves the structure and stability of compounds in the apatite family of minerals. Calcium hydroxy apatite, the major constituent of bone and teeth, serves as a prototype for the study of the substitution of carbonate and other anions for the phosphate and hydroxide ions. The study should lead to a better understanding of the effect of carbonate and other anions on the solubility and structure of apatites. Yoder, C.H. ; Pasteris, J.D. ; Worcester, K.N. ; Schermerhorn, D.V. Structural water in carbonated hydroxylapatite and fluorapatite: confirmation by solid state 2H NMR, Calcified Tissue International, 2012, 90, 60-67. Yoder, C.; Pasteris, J.; Worcester, K.; Schermerhorn, D.; Sternlieb, M.; Goldenberg, J.; Wilt, Z., Dehydration and Rehydratiom of Carbonated Fluor- and Hydroxylapatite. Minerals, 2012, 2, 85-99. Yoder, C. H.; Pasteris, J.D. ; Krol, K.A. ; Weidner, V. L.; Schaeffer, R. W., Synthesis, Structure, and Solubility of Carbonated Barium Chlor- and Hydroxylapatites, Polyhedron, 2012, 44, 143-149. Pasteris, J.D. ; Yoder, C.H. ; Sternlieb, M. P.; Liu, S. Effect of carbonate incorporation on the hydroxyl content of hydroxylapatite, Mineralogical Magazine, 2012, 76, 2741-2759. Pasteris, J.D. ; Yoder, C. H.; Wopenka, B., Molecular water in nominally unhydrated carbonated hydroxylapatite: the key to a better understanding of bone mineral, American Mineralogist, 2014, 99, 16-27. Weidner, V. L.; Carney, M. C.; Schermerhorn, D. V.; Pasteris, J. D.; Yoder, C. H., A-type substitution in carbonated strontium fluor-, chlor- and hydroxylapatites, Mineralogical Magazine, 2015 in press. Goldenberg, J. E.; Wilt, Z.; Schermerhorn, D. V., Pasteris, J. D.; and Yoder, C. H., Structural effects on incorporated water in carbonated apatites, American Mineralogist, 2015, 100, 274-280. Yoder, C. H.; Landes, N.T. ; Tran, L.K. ; Smith, A.K. ; Pasteris, J.D. The relative stabilities of A- and B-type carbonate substitution in apatites synthesized in aqueous solution., Mineralogical Magazine, 2015, in press. In the summer of 1970 Schaeffer headed for graduate school at the Albany campus of the State University of New York. The first graduate faculty member that Schaeffer encountered was Professor Jerold J. Zuckerman, who had served as the graduate mentor for Yoder several years earlier and who had recently relocated to Albany with his graduate students and postdocs. 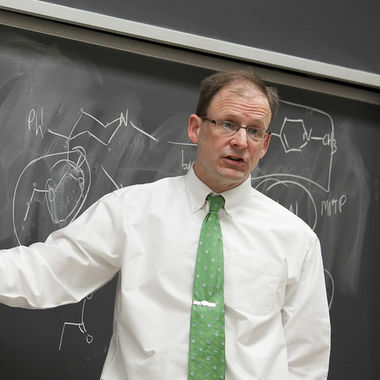 Zuckerman served as Schaeffer’s Ph.D. advisor for the next four years. 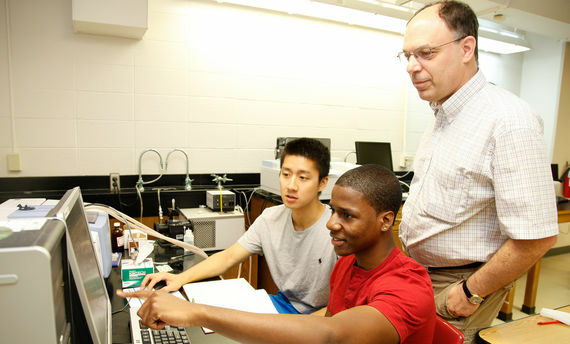 This was an especially productive time for a collaboration between the three that led to a number of jointly authored papers, but, more importantly, to a life-long interest in inorganic chemistry and to application of nuclear magnetic resonance (NMR) spectroscopy to the solution of structural and dynamic problems. Schaeffer completed graduate school at Albany in 1974, was hired at Elizabethtown College (only 15 miles from F&M) in 1976, and the strong ties of the Yoder-Schaeffer collaboration were renewed. Their research collaboration has yielded both short- and long-term benefits to the two investigators and to their students. 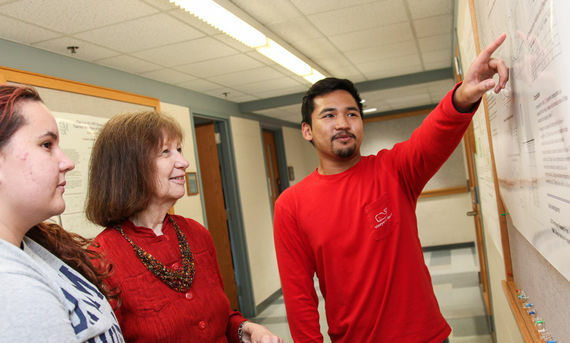 Nineteen papers carrying the names of student investigators appear in scientific journals. F&M and Elizabethtown student presenters are well-represented at regional and national meetings, communicating their work in oral or poster form. Yoder and Schaeffer have collaborated on a successful undergraduate textbook on the subject, as well as on other projects relating NMR to both research and teaching. "I was asked to filter this beautiful moisture-sensitive, purple solid. So, beaming with pride and using my best freshman chemistry technique, I checked out brand new glassware from the stockroom, set up the filtration system, turned on the suction, moistened the filter paper with distilled water to make a good seal, added the solid, and, of course, promptly destroyed it. Luckily, Yoder had not entrusted the entire supply of the sample to a lowly freshman!" C.H. Yoder, T.M. Agee, A.K. Griffith, C.D. Schaeffer, Jr., M.J. Carroll, A.S. DeToma, A.J. Fleisher, C.J. Gettel, and A.L. Rheingold. "Use of 73Ge NMR Spectroscopy and X-ray Crystallography for the Study of Electronic Interactions in Substituted Tetrakis(phenyl)-, -(phenoxy)-, and -(thiophenoxy)germanes," Organometallics 2010, 29, 582-590. C.H. Yoder, A.K. Griffith, A.S. DeToma, C.J. Gettel, C.D. Schaeffer, Jr. "Hypercoordination in Triphenyl Oxinates of the Group 14 Elements," J. Organomet. Chem. 2010, 695, 518-523. M.P. Sternlieb, H.M. Brown, C.D. Schaeffer, Jr., and C.H. Yoder. "Synthesis of Apatites with an Organophosphate and in Nonaqueous Media," Polyhedron 2009, 28, 729-732. C.H. Yoder, T.M. Agee, C.D. Schaeffer, Jr., M.J. Carroll, A.J. Fleisher, and A.S. DeToma. "Use of 73Ge NMR Spectroscopy for the Study of Electronic Interactions," Inorg. Chem. 2008, 47, 10765-10770. C.A. Strausser, M.W. Thomsen, C.H. Yoder and C.D. Schaeffer, Jr. "Data Tables for General, Organic and Physical Chemistry," 2nd ed., 2007 (a sixty-page pamphlet of data tables for use in chemistry courses). C.H. Yoder, T.M. Agee, K.E. Ginion, A.E. Hofmann, J.E. Ewanichak, C.D. Schaeffer, Jr., M.J. Carroll, R.W. Schaeffer and P.F. McCaffrey. "Relative Stabilities of the Copper Hydroxy Sulfates," Mineral. Mag. 2007, 71(5), 571-577. A.J. Fleisher, C.D. Schaeffer, Jr., B.A. Buckwalter and C.H. Yoder. "1H, 13C, and 73Ge NMR Spectral Analysis of Substituted Aryltrimethylgermanes." Magn. Reson. Chem. 2006, 44(2), 191-194. C.H. Yoder, N. Fedors, N.J. Flora, H. Brown, K. Hamilton, and C.D. Schaeffer, Jr. "The Existence of Pure Phase Transition Metal Hydroxy Apatites." Synth. React. Inorg. Met.-Org. Chem. 2004, 34(10), 1835-1842. L.A. Margolis, C.D. Schaeffer, Jr., and C.H. Yoder. "A Lead-207 NMR Study of the Adducts of Triphenyllead Chloride and Diphenyllead Dichloride," Appl. Organomet. Chem. 2003, 17(4), 236-238. L.A. Margolis, C.D. Schaeffer, Jr., and C.H. Yoder. "A Silicon-29 NMR Study of Adduct Formation in Organosilanes, "Synth. React. Inorg. Met.-Org. Chem. 2003, 33(3), 359-367. H.D. Harle, S. Han, C.H. Yoder, C.D. Schaeffer, Jr., P.L. Falen, B.J. Frost, S.R. Hatalla, S.D. Kerstetter, J.K. Redline, S.L. Uliana, and L.L. Walton. "Properties and Reaction of Organosilanes and Organogermanes Containing the Potentially Bidentate (X(CH2)n)2N- Group," Synth. React. Inorg. Met.-Org. Chem. 2003, 33,(10), 1825-1834. C.H. Yoder, C.D. Schaeffer, Jr., L.L. Walton, P.L. Falen, J.K. Redline, S. Han,M. Shah, C. Krug, and S.D. Lao. "The Role Of Conformational Flexibility In the Hypervalency of Organosilanes,"Main Group Met. Chem. 2001, 24(7), 409-411. C.H. Yoder, J.E. Mihalick, W.J. Kowalski, J.L. Ealy, J.N. Spencer, C.D. Schaeffer, Jr., J.L. Green, K.J. Sullivan, C.S. Yoder, and L.C. Prokop. "The Synthesis, Structure and Lewis Acidity of Bidentate Organotin Alkanes and Carboxylates. "Main Group Met. Chem. 1995, 18(1), 43-50. C.H. Yoder, W.D. Smith, B.L. Buckwalter, C.D. Schaeffer, Jr., K.J. Sullivan, and M.F. Lehman. "A Multinuclear NMR Study of N-(Chlorodimethylsilylmethyl) Amides," J. Organomet. Chem. 1995, 492, 129-133. B.K. Barr, A.J. Herman, L.K. Myers, P.I. Young, C.D. Schaeffer, Jr., H.J. Eppley, J.C. Otter, and C.H. Yoder. "Multinuclear NMR Spectroscopic Studies of Some Organometallic N-Substituted Anilines," J. Organomet. Chem. 1992, 434, 45-52. C.D. Schaeffer, Jr., L.K. Myers, S.M. Coley, J.C. Otter, and C.H. Yoder. "Preparation, Analysis and Reactivity of Bis[N,N-bis(trimethylsilyl)amino]tin(II): An Advanced Undergraduate Laboratory Project In Organometallic Synthesis," J. Chem. Educ. 1990 67, 347-349. C.D. Schaeffer, Jr., and C.H. Yoder. "NMR Bibliography," available in computer diskette (IBM and Apple formats) and photocopy versions directly from the authors, 1988. M.S. Samples, C.H. Yoder, and C.D. Schaeffer, Jr. "The Structure of Bis(trimethylsilyl) Amides. A Multinuclear NMR Project," J. Chem. Educ. 1987, 64, 177-178. C.H. Yoder and C.D. Schaeffer, Jr. "Introduction to Multinuclear NMR: Theory and Application," Benjamin/Cummings, CA, 1987 (ISBN 0-8053-9750-7). C.H. Yoder and C.D. Schaeffer, Jr. "Instructor's Guide to Accompany 'Introduction to Multinuclear NMR'," Benjamin/ Cummings, CA, 1987 (ISBN 0-8053-9751-5). C.D. Schaeffer, Jr., and C.H. Yoder. "Synthesis and Multinuclear Lanthanide Shift Reagent NMR Analysis of l- and 2-Adamantanol. An Advanced Undergraduate Laboratory Project," J. Chem. Educ. 1985, 62, 537-540. C.H. Yoder, F.K. Sheffy, R. Howell, R.E. Hess, L. Pacala, C.D. Schaeffer, Jr., and J.J. Zuckerman. "Multiple Regression Analysis of Carbon-13 Chemical Shifts and Carbon-13 Proton Coupling Constants in ortho-Substituted Aromatics," J. Org. Chem. 1976 41, 1511-1517. C.D. Schaeffer, Jr., J.J. Zuckerman, and C.H. Yoder, "Carbon-13 Chemical Shifts of Substituted t-Butylbenzenes, Phenyltrimethylsilanes and Phenyltrimethylgermanes," J. Organomet. Chem. 1974, 80, 29-35. R.E. Hess, C.D. Schaeffer, Jr., and C.H. Yoder, "13C-H Coupling Constants of Some Benzaldehydes," J. Chem. Eng. Data 1972, 17, 385-386. R.E. Hess, C.K. Haas, B.A. Kaduk, C.D. Schaeffer, Jr., and C.H. Yoder, "Nuclear Magnetic Resonance Studies of the Bonding in Aryltrimethylsilanes and -germanes, Aryldimethylphosphines and -arsines, and Arylmethylsulfides," Inorg. Chim. Acta 1971, 5, 161-166. R.E. Hess, C.D. Schaeffer, Jr., and C.H. Yoder, "13C-H Coupling Constants as a Probe of ortho-Substituent Effects," J. Org. Chem. 1971, 36, 2201-2202. C.H. Yoder, D.R. Griffith, and C.D. Schaeffer, Jr., "13C-H Coupling Constants of Some Group IV and Group V Amines," J. Inorg. Nucl. Chem. 1970, 32, 3689-3691.